CO2 in the air comes from volcanoes, the oceans and other natural sources, not humans. What's causing climate change? Human beings. Just ask 97% of the top climate scientists in the world. Carbon dioxide (CO2) is the main heat-trapping gas largely responsible for most of the average warming over the past several decades. There are ways that scientists can tease apart the atmospheric concentration of CO2 to see how much of the CO2 is from natural sources and how much is from combusted fossil fuel sources. The atmospheric concentration of CO2 has increased from a pre-industrial era (AD 1000-1750) concentration of approximately 280 parts per million (ppm) to around 392 ppm in 2011. Carbon dioxide from burning fossil fuels is chemically different than carbon dioxide that occurs naturally, so scientists can tell that fossil fuel emissions comprise the largest source of the increase since the pre-industrial era. Here’s how scientists know. The same elements (i.e., same number of protons in the nucleus) with different mass numbers (arising from the different numbers of neutrons in the nucleus) are called isotopes. Each carbon molecule has six protons in the nucleus, but there are many different isotopes with varying numbers of neutrons in the nucleus. Carbon isotopes from different sources can be “lighter” (high negative value) or heavier (lower negative value). For example, carbon from the ocean has a value of “0” while carbon from fossil fuels ranges from -20 to -32. Atmospheric carbon has an average value of -5 to -9 and it is becoming “lighter” over time as “lighter” carbon from fossil fuels become more abundant in the atmosphere (Figure 1). Figure 1: The “fingerprint” of fossil fuel emissions contained within atmospheric carbon dioxide. 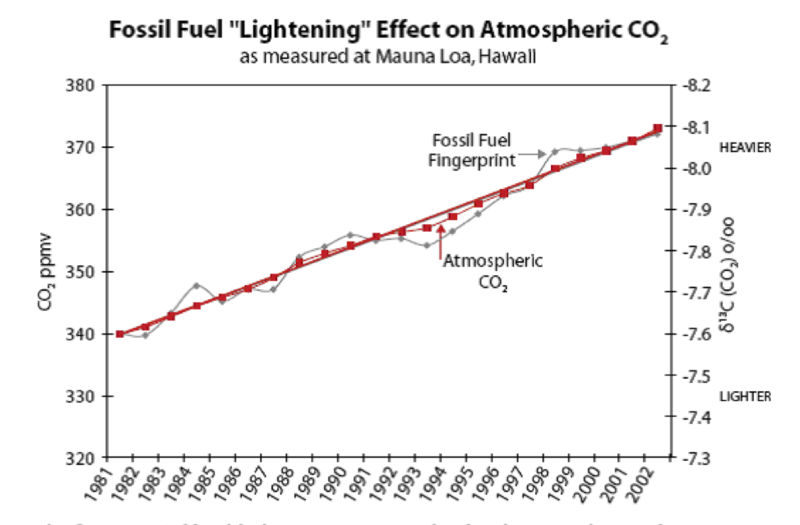 The isotope signature of fossil fuels (grey line) corresponds to the increase in atmospheric concentration of CO2 (red line). The isotope data are expressed as δ13C (CO2) ‰ (per mil) deviation from a calibration standard. Note that this scale is inverted to improve clarity with the correlation. © Union of Concerned Scientists.